In early June, Nicaragua’s leading young activists went on a junket to Washington, D.C., on the dime of the U.S. government-funded right-wing advocacy group Freedom House. The Nicaraguan student leaders were there to beseech President Donald Trump and other right-wing U.S. government officials to help in their fight against Nicaraguan President Daniel Ortega. On the excursion to the U.S. capital, the young activists posed for photo-ops with some of the most notorious neoconservatives in the U.S. Congress: Senators Ted Cruz and Marco Rubio and Rep. Ileana Ros-Lehtinen. The Nicaraguan student leaders were also shepherded to meetings with top officials from the State Department and the U.S. government soft-power, organization USAID. There, they were reassured that they would have Washington’s full-throated support. A month before the student protesters’ meetings with ultra-conservative lawmakers in Washington, a publication funded by the U.S. government’s regime-change arm, the National Endowment for Democracy (NED), bluntly asserted that organizations backed by the NED have spent years and millions of dollars “laying the groundwork for insurrection” in Nicaragua. This article openly boasting of U.S. meddling was published in the Latin America-focused news website Global Americans, and was authored by U.S. academic Benjamin Waddell, the academic director of the School for International Training in Nicaragua. Following publication of this piece, Global Americans replaced the term “insurrection” with the more innocuous word “change.” The original headline can, however, still be seen in the article’s URL. Despite the cosmetic alteration, Waddell’s article offers a remarkably candid assessment of the impact of the NED’s sustained investments in Nicaraguan civil society. The author’s conclusions inadvertently echoed those of President Ortega and his supporters, who have framed the protests as a carefully staged plot backed to the hilt by Washington. “International press has depicted the rapid escalation of civil unrest in Nicaragua as a spontaneous explosion of collective discontent, triggered by the government’s changes to its insolvent social security system and rooted in more than a decade of authoritarian rule by the Ortega-Murillo family,” Waddell wrote. And while the underlying causes of the turmoil are rooted in government mismanagement and corruption, it’s becoming more and more clear that U.S. support has helped play a role in nurturing the current uprisings. The NED is a leading agent of U.S. soft power that has meddled in other countries’ affairs since its founding at the height of the Cold War, in 1983. Its first success took place in Nicaragua, where it incubated anti-Sandinista media outfits such as La Prensa newspaper through a cut-out, Prodemca, that was also covertly funded by allies of Oliver North. In 1990, the Sandinistas were defeated at the polls by the right-wing candidate Violeta Chamorro, whose family happened to own La Prensa. Chamorro’s victory represented the culmination of nearly U.S.$16 million in NED grants to anti-Sandinista political parties and media outlets. “A lot of what we do today was done covertly 25 years ago by the CIA,” Allen Weinstein, a founder of the NED, commented in 1991. In the years that followed, the NED and its partners have helped swing elections for right-wing neoliberal candidates in Russia and Mongolia in 1996; fomented a coup that drove Haiti’s democratically elected president Jean Bertrand Aristide from power; and directed millions towards dismantling Venezuela’s socialist government, an ongoing effort complemented by crushing U.S. sanctions. 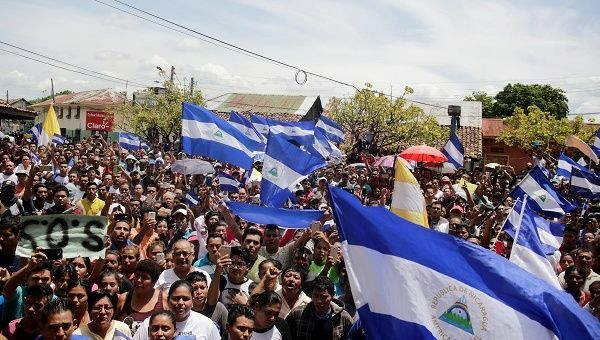 The unrest that has paralyzed Nicaragua was triggered by the announcement by President Ortega of reforms to the nearly bankrupt social security system. The International Monetary Fund and a local business umbrella group had insisted on changes that would have raised the retirement age and gradually privatized health clinics, threatening some of the most significant gains of the Sandinista revolution. When Ortega countered with a proposal that would have demanded a greater contribution into the system from businesses and retirees, with business owners paying the lion’s share, a sector of the public exploded with outrage. The angry reaction to Ortega’s plan, reinforced with intensive coverage by opposition media sources, became the spark for rolling protests that have set the country on fire—literally, in many cases. Meanwhile, masked men toting homemade mortars and firearms have formed the front line of the tranque road blocks that have already drained Nicaragua’s economy of some U.S.$250 million in revenue. To date, at least 170 people have been killed in the chaos. As the death toll mounts on both sides, talk of a new civil war seems like a more than remote possibility. Hagamos Democracia (‘Let’s Make Democracy’) is the largest recipient of NED funding, reaping over U.S.$525,000 in grants since 2014. The group’s president, Luciano Garcia, who oversees a network of reporters and activists, has declared that Ortega has turned Nicaragua into a “failed state” and demanded his immediate resignation. The Managua-based Institute for Strategic Studies and Public Policy (Ieepp) has received at least US$260,000 from the NED since 2014. The grants have been earmarked to support the Ieepp’s work training activists in “encouraging debate and generating information on security and violence.” The funding has also covered efforts to monitor the “increased presence of Russia and China in the region,” an obvious priority for Washington. Earlier this month, Mariadaga led an opposition delegation to Washington to denounce Ortega’s rule before the General Assembly of the Organization for American States (OAS). He was joined by Anibal Toruno, director of Radio Dario—another longtime recipient of support from NED, and one of the key hubs of anti-Ortega media in the Nicaraguan city of Leon. While Mariadaga was in Washington, he was charged by the Nicaraguan police with overseeing an organized criminal network that has murdered several people during the violent unrest that has gripped the country. Mariadaga slammed the allegations as a “political persecution” and a “ridiculous accusation,” but postponed his return to Nicaragua. The U.S. State Department backed him up with a statement of vehement support. Among the U.S. officials to receive the students was USAID director Mark Green. “We need to stand with those who are standing up for things that we need to believe in,” Green said of the students, in an interview with McClatchy. Aside from NED, USAID has been the most active promoter of regime change against socialist-oriented governments in Latin America. In Nicaragua, USAID’s budget topped U.S.$5.2 million in 2018, with most of the funding directed towards training civil society and media organizations. The Nicaraguan students’ junket to Washington was paid for by Freedom House, a U.S. government-funded NED partner whose agenda typically aligns with the neoconservative wing of the American foreign policy establishment. Max Blumenthal is an award-winning journalist and the author of several books, including best-selling Republican Gomorrah, Goliath, The Fifty One Day War, and The Management of Savagery. He has produced print articles for an array of publications, many video reports, and several documentaries, including Killing Gaza. Blumenthal founded The Grayzone in 2015 to shine a journalistic light on America’s state of perpetual war and its dangerous domestic repercussions. Follow him on Twitter at @MaxBlumenthal.